If you are going to play this game, you better have a good rain coat. 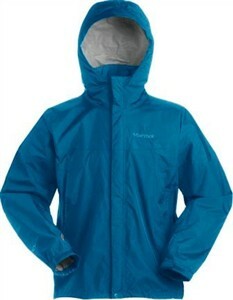 I like this Marmot Men's PreCip Rain Jacket because it folds up very compact and fits very easily in my golf bag. If this jacket doesn't keep you dry, nothing will. It is 100-percent seam taped. The reason golfer are going to appreciate this jacket, besides the fact it fits in your bag, is it has a patented Angel-Wing Movement technology. This allows your arms full range of motion, which is obviously essential when swinging the golf club. The jacket has zippered vents in the underarms and a hood that allows good visibility. Another cool feature that golfers will appreciate (but designed with backpackers in mind) is the slanted chest pockets. These allow access while still wearing your golf bag on your back. Thus, you don't have to set your bag down to go for that granola bar or tissue you have tucked in your shirt. I would recommend this jacket for all golfers. If you live in a place where it rains frequently like I do, you should buy a full rain suit with pants. I like the Frogg Toggs Pro Action Classic Suit. This is also compact and will fit in your golf bag very nicely.